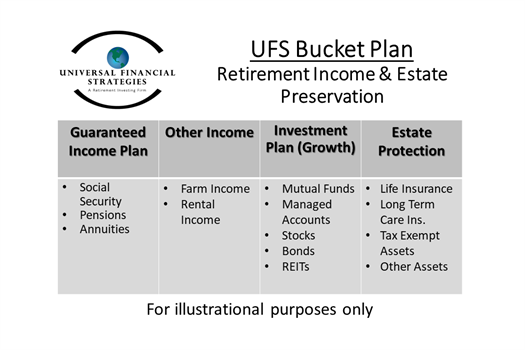 Your personalized UFS Bucket Plan is built on a foundation of guaranteed income like Social Security, pensions and annuities to provide you with the retirement lifestyle you deserve. Our advisors incorporate growth strategies designed to help you outpace inflation and continue living your retirement your way. Long term healthcare, charitable giving, and protecting your estate for your heirs are included in your UFS Bucket Plan.